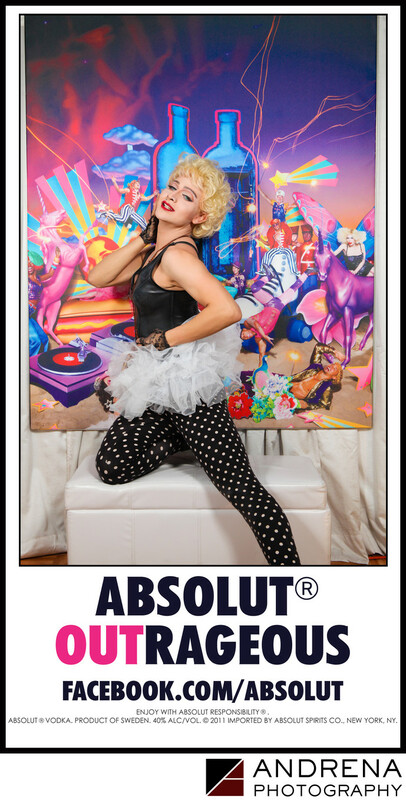 The Absolut Outrageous campaign hired top event photographer Dina Douglass to photograph its three stops in Los Angeles. A canvas by David LaChapelle was hung in the back of the Absolut Vodka Outrageous truck, which was then driven to and parked outside three bars in West Hollywood and Long Beach. Performers and club attendees were invited inside to have their photo taken with the canvas, and the subjects were each invited to be as outrageous as possible. This image of Venus D-Lite brought to mind Madonna from the movie Who's That Girl. This promotional campaign celebrated Absolut Vodka's 30 years of supporting going out and coming out. The images were downloadable by each subject via the Absolut Facebook page.